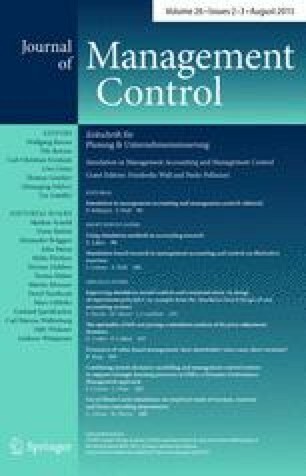 This paper addresses current and future aspects of the use of Monte Carlo simulation in controlling departments and examines context as well as company-internal factors that may drive the intensity of its usage. To this end, we conducted an empirical survey that was completed by 445 participants from Germany, Austria and Switzerland. The results suggest a rather low adoption rate of Monte Carlo simulation in controlling, but at the same time, the quality of knowledge concerning Monte Carlo simulation within the companies is much higher. In addition, we identify a strong increase in the use of Monte Carlo simulation very recently, and its use is expected to increase threefold within the next 5 years. Furthermore, regression analyses indicate that the use of Monte Carlo simulation is mainly driven by company-internal factors such as its perceived relevance and years of usage. Contrary to our expectations, context factors such as perceived environmental uncertainty do not explain usage, and only company size and industry sector have significant effects. An earlier version of the paper benefited from discussions at the ACMAR in Vallendar. We would like to thank Prof. Dr. Dr. h.c. Jürgen Weber and the team of the WHU-Controller Panel for the opportunity to integrate our questions in the annual WHU-Controller Panel. Explanation The following questions refer to the usage of Monte Carlo simulation. Monte Carlo simulation allows for an explicit examination of uncertainty. The input parameters are described by probability distributions instead of single values. Therefore, for example a range of possible alternative exchange rates can be analyzed instead of one single exchange rate. The outcome displays a probability distribution as well, e.g., a project’s rate of return. By means of Monte Carlo simulation, the decision-maker realizes which results are caused by a particular course of action and how high the probability for such outcomes is. Thereby, simulation is supported by Excel plug-ins. Horváth & Partners. (2011). Chancen-und Risikomanagement in wachstumsstarken Zeiten: CFO-Panel http://www2.horvath-partners.com/fileadmin/media/PDF/de/08_Presse/Auswertung%20CFO-Panel-Blitzumfrage_Dez%202010.pdf. Accessed 16 May 2012.